NEW ORLEANS (September 22, 2016) — Changes in climate, heartworm vectors, diagnostic challenges, prevention practices and treatment protocols all were cited during during the 2016 American Heartworm Society (AHS) Triennial Symposium as reasons why the persistence of heartworm disease continues to confound veterinarians, researchers and pharmaceutical companies. “Heartworm disease remains one of the most important—and complex—diseases we address in veterinary medicine, and the information presented at this year’s AHS symposium reflected the complexity of understanding and addressing the disease,” stated Dr. Clarke Atkins, co-chair of the 15th Triennial Heartworm Symposium program committee. 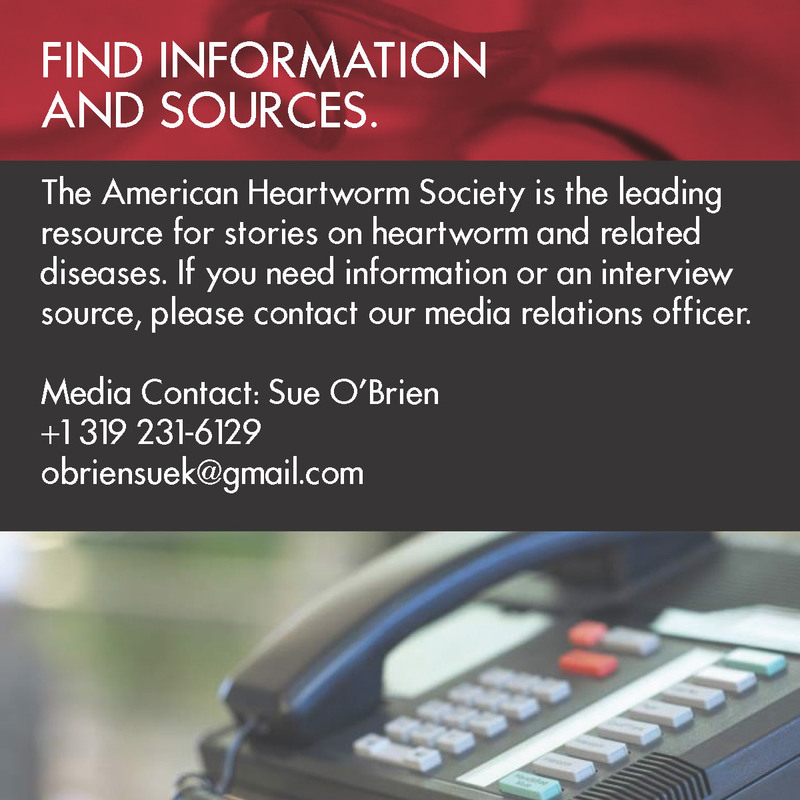 “The AHS mission and guidelines focus on three aspects of heartworm management: prevention, diagnosis and treatment. The information we heard addressed all three,” added incoming AHS president Dr. Christopher Rehm. A record audience of almost 400 veterinarians, researchers and industry representatives from 13 countries and 29 states listened to discussions on the pros and cons of different heartworm treatment protocols, the latest insights on mosquito vectors and blocking strategies, and updates on heartworm resistance and diagnostic techniques. A total of 37 speakers from seven countries presented during the two-and-a-half-day symposium held September 11-13, 2016. During the triennial business meeting held during the symposium, 2013-2016 AHS president Dr. Stephen Jones of Moncks Corner, South Carolina, turned over leadership of the AHS board to new president Dr. Christopher Rehm of Mobile, Alabama. Board members Dr. Robert Stannard of Livermore, California, Dr. Wallace Graham of Corpus Christi, Texas, Dr. Martha Smith-Blackmore of Boston, Massachusetts, and Dr. Matthew Miller of Phoenix, Arizona, retired from the board and were replaced by Dr. Christopher Duke of Ocean Springs, Mississippi, Dr. Jennifer Rizzo of Corpus Christi, Texas, Dr. Brian DiGangi of the University of Florida in Gainesville, Florida, and Dr. Andrew Moorhead of the University of Georgia in Athens, Georgia. Dr. Stannard, who served as AHS secretary/treasurer, turned over his responsibilities to board member Dr. Bianca Zaffarano of Iowa State University in Ames, Iowa. Dr. Stephen Jones will remain on the board as immediate past-president, while Dr. Patricia Payne will serve as editor of the AHS Bulleting, replacing Dr. Doug Carrithers, who will remain on the board as an ex-officio member. Speakers on this topic included Drs. Marisa Ames, Dwight Bowman, Amanda Coleman, Michael Dzimianski, Claudio Genchi, Changbaig Hyun, Laura Kramer, Mark Papich and Molly Savadelis. Studies on non-arsenical heartworm treatment protocols, a comparison of minocycline vs. doxycycline in heartworm treatment protocols and an examination of the susceptibility gap in treatment of canine heartworm infections were covered. Speakers included Drs. Rick Alleman, James Carmichael, Brian DiGangi, Ray Dillon, Laura Kramer, Norma LaBarthe, Lindsay Starkey and Luigi Venco. Topics included the pros and cons of heat treatment of serum samples and a comparison of commercial antigen tests. Speakers on this topic included Drs. Ray Dillon, Changbaig Hyun and Elena Carretón. Topics included the cardiopulmonary effects of heartworm byproducts in the circulation of dogs, cats and rats, and the evaluation of inflammatory biomarkers in dogs with heartworm disease before and after adulticidal treatment. Speakers on this topic included Drs. Clarke Atkins, Catherine Bourguinat, Dwight Bowman, Timothy Geary, Ray Kaplan, Tom McTier, Andrew Moorhead, Roger Pritchard and Adrian Wolstenholme, with presentations focused on trends in lack of efficacy (LOE) reports; genetic profiles of potentially resistant isolates, and practitioner identification of potentially resistant isolates. Speakers on this topic included Drs. John McCall, Tanya McKay, Tom Nelson, Audrey Odum and Michael Povelones. This session covered entomology, parasitology, human malarial research, microclimate data and the role of mosquito blocking in heartworm prevention.